5 Hot Summer Grilling Tips and an EASY Shrimp Kabob Recipe! But first, here are 5 grilling tips you need to know right now! 1. Don't clean that grill! (Too much, anyway.) If you're OCD about scraping every little bit of char off your grill, you may be missing out on fantastic flavor. 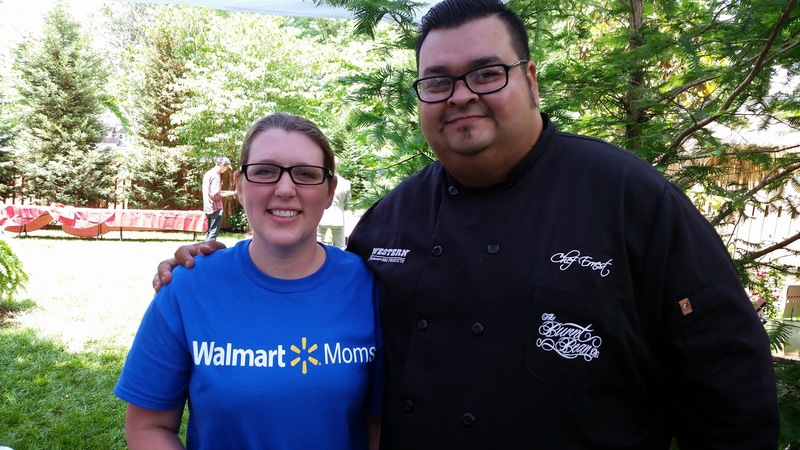 Chef Ernest Servantes, of TV's Chopped, met with me and the other Walmart Moms to show us the right way to treat a grill. He emphasized that a "seasoned" grill is like cast iron. You want it to be used well to develop even more flavors in your dishes! 3. Don't soak the wood chips. Have you heard that old saying that you should soak wood chips before putting them on the grill? That's not true! In fact, wood chips are made to be dry and have spent many hours in a special kiln to have the moisture taken out. To soak them just undoes all the hard work! 4. Fruit is great on the grill. Have you been scared to try anything but meats on your grill? You really should give something new a try. Peaches are an easy fruit to start with because they are large, firm, and have their skins to keep them in one piece. Denise at Wholesome Mommy does a mean Grilled Peaches and Nectarines with Almond Cream! 5. Dessert is, too! I betcha didn't know that you can grill cakes and donuts, too! We did grilled donuts last year and LOVED them. Pair them with the grilled fruit for a complete outdoor meal. Here is pic of Chef Ernest and I after I asked him more questions. To make the basting sauce, simply mix 1 part honey to 1 part lime juice. Add a few shakes of garlic salt and mix well. Set aside to "rest" while you make your kabobs. Using thawed or fresh jumbo shrimp (I used Great Value brand below).. thread them on the kabob skewers, peels, legs, and all! Alternate shrimp with fresh veggies such as red onion and tomatoes. Turn your grill on to "sear" setting, if you use a gas grill. Otherwise, you can use your charcoal grill as soon as it is hot. Place the skewers directly on the grill or use a skewer rack like this one I use. Turn the skewers at least one time during cooking. Once the shrimp is pink, firm, and cooked completely through, remove the skewers from the grill. Serve each guest their own kabob, or remove all the pieces and serve on a platter. I like to eat this with fresh bread and spinach salad! I used to be scared to grill, thinking it was something only my husband was good at. As you can see, however, working with Walmart has given me a chance to get comfy in my grilling mitts. I'm so happy with how this recipe turned out and encourage you to give grilling a try, even if you haven't done so before!